ENVIRONMENT ministry staff, together with various law enforcement agencies, have been dispatched to Uuwiyu-Uushona to contain a rhino that reportedly escaped from the Etosha National Park. Villagers notified environment officials after they spotted the rhino in a mahangu field. He added that it is common for rhinos to escape the national park through elephant breaks. 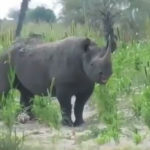 “The video clearly shows that procedures are being adhered to, thus the ministry of environment and tourism officials are monitoring the precious rhino as part of our capture operation,” he concluded.